The bi-annual forecast of GS1 Switzerland and University of Saint-Gall suggests that the Swiss logistics industry is looking forward to a few rather pleasing months. Economic development in Switzerland, as in the most European countries, is positive. The secretary of state (SECO) expects an annual growth of the GDP of 1.9% in Switzerland for 2018. The European Union predicts a growth of 2.1%. These forecasts are essential for the logistics sector since the development in this field of activity is generally parallel to that of the economic situation. 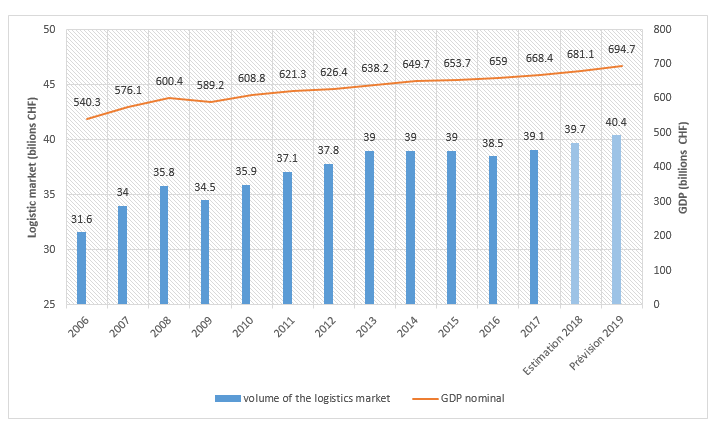 Every year the University of Saint-Gall and GS1 Switzerland study and publish a bi-annual forecast of the Swiss logistics market. Their last report paints a positive picture of this branch. Based on the statistics of August, the market volume is expected to grow by around 1.7% to reach almost CHF 40 billion. The sound conjuncture in neighboring countries, especially in Germany, plays a decisive role in this regard, as more goods transported transit Switzerland. The authors of this study are also optimistic for 2019. Due to strong domestic demand and overall economic growth, the logistics market is expected to increase to CHF 40.6 billion. This would correspond to an increase of 1.9%, which is comparable to the increase in GDP. It must not be forgotten however that international trade disputes can rapidly affect the situation. Like for many developments in the logistics world, the explanation can be found in e-commerce. The boom in this industry is resulting in lighter yet more valuable goods. Generally speaking, the Swiss logistics market is in a positive phase, which is expected to continue in the coming months. ATM Global Logistics has provided logistics and e-commerce services for many years. Do not hesitate to contact us for offers!